Happy birthday, dear friend! I'm so thankful for the wisdom and poetry you bring to my life! Happy birthday, Mary Lee! "one ring wiser", indeed. If wisdom were distance, the girth of that heart of yours rivals the General Sherman! Another not-haiku. Started this one over Thanksgiving and have not been able to give it up, so off it goes! under the weak sun and slowly shuffled home. it seemed the branches plucked them from the sky. a grasping past. We gather near the embers. hangs longer than seems possible. In the darkness, it rises. Steve- This is beautiful. That first line. I read it. And read it. And read it again because it is so perfect and it just sort of catches my heart. Then the images in the second stanza. Wow! And the branches "plucked from the sky." The "grasping past." And the line breaks. I love this. Left you one on twitter ..
Loving your site with beautiful haikus. I need to really dig deep into the art of haiku writing. I've been reading Carol's haiku, and I knew you nudged her. Just found yours. 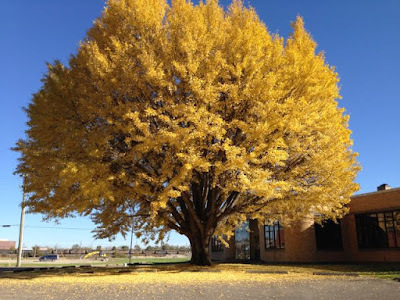 Love gingko trees and Eve Merriam's poem that was in our 6th grade anthology. Happy Birthday! Happy birthday and thank you for inspiring me to participate in this month of writing! Would welcome any feedback for this novice writer.